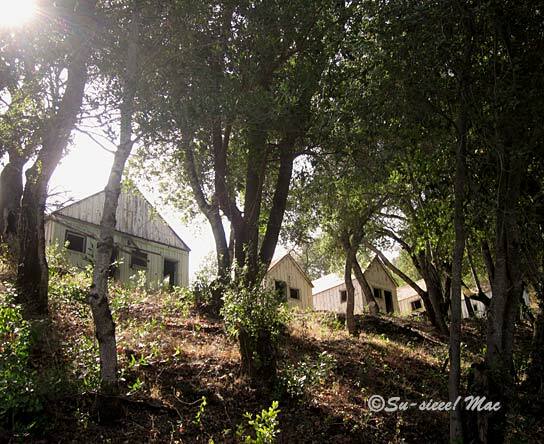 For many years, I've wanted to visit the Gilroy Yamato Hot Springs, a once-upon-a-time very popular resort in the foothills of the southern end of the Diablo Range. 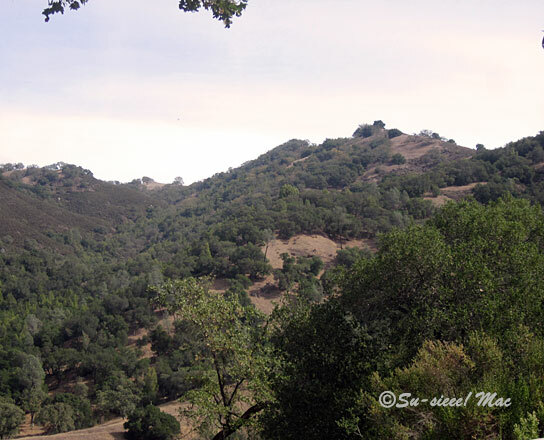 Now part of the Henry Coe State Park, this historic landmark is about 10 miles northeast of Gilroy, California, which is nearby my town of Hollister. 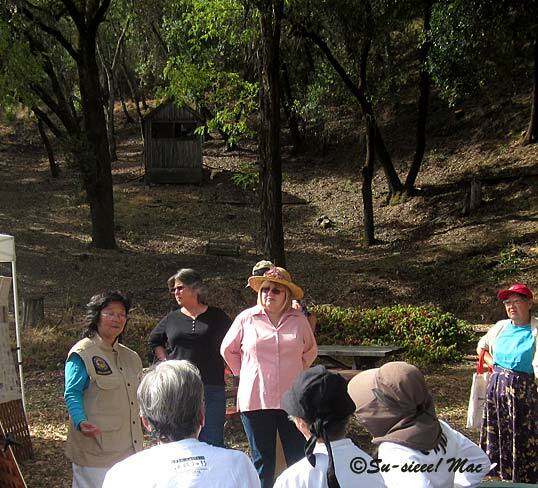 Unless there are special events or planned guided tours by the all-volunteer, nonprofit group Gilroy Yamato Hot Springs (GYHS), the place is not open to the public. Two weeks ago, GYHS held a special event to celebrate the 20th anniversary of the hot springs being made a historic landmark. (It's listed on the National Register of Historic Places and also designated as a California Historical Landmark.) Yup, the Husband and I attended the event. The grand hotel, club house, swimming pool, soaking pools, and other magnificent structures of long ago no longer exist. Many of the guest cottages still stand. The GYHS has renovated several of the cottages already. One of the volunteers told us that because they are historic structures, they must be rebuilt in the same manner. That means if something was built incorrectly, it can't be fixed, but built incorrectly again. The buildings were constructed between 1870s and 1920s, which, if you think of it, incorrect construction isn't always all that bad. The Gilroy Yamato Hot Springs is a beautiful, peaceful place. I can see why people of long ago were willing to travel for hours on dusty trails to get there. San Franciscans, for example, traveled three hours by train to Gilroy, then another three hours in a horse and buggy after a night's stay in town. Staying a week or two in a luxurious resort in the wilderness had to be a lovely respite from the city. The 24 cottages were named after the states. 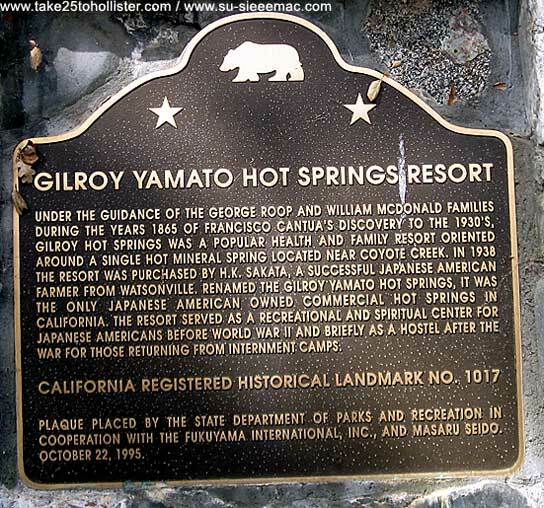 The history of Gilroy Yamato Hot Springs goes back to 1855 when a shepherd stumbled upon it as he was looking for his sheep. 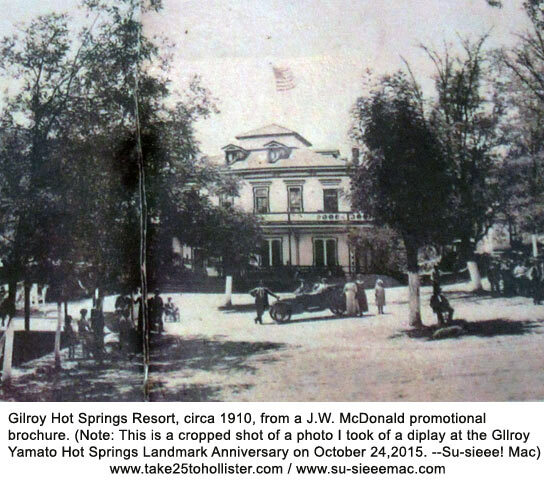 Twenty years later, the hot springs became a big-time, fancy resort that attracted people from near and far, including the rich and famous, such as Mayor James Phelan of San Francisco and hot-shot industrialist Claus Spreckels. 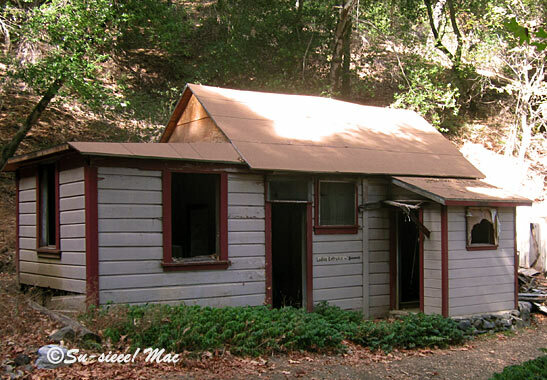 Prior to 1938, the place was known as the Gilroy Hot Springs and it was considered the best mineral springs in California. The springs are still there, but, they cannot be used. During our guided tour, we saw a small stream and hole. If I recall correctly, the water was about 110 degrees. 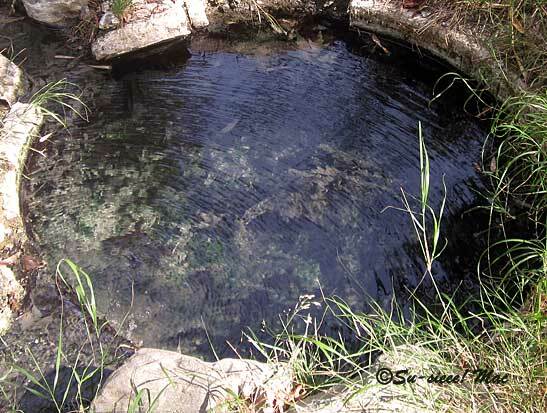 Interestingly, we learned that mineral springs are usually found near mercury deposits. Watsonville lettuce grower Harry K. Sakata purchased the property in 1938, making it the only mineral spring resort in California owned by a Japanese American. This was a very big thing back then when Japanese were among the various minority groups being discriminated, whether they were immigrants or born in the United States. Under his ownership, Sakata added Yamato, which means Japanese, to the property's title. This Shinto Shrine was originally part of the 1939 World's Fair Japanese Pavilion. When the U.S. entered World War II, nearly all of the Japanese Americans, including Sakata, were placed in internment camps in remote areas of the United States. After the war, Sakata regained ownership of the hot springs and allowed interned Japanese Americans to reside there until they found places to live. Laura Dominguez-Yon, one of the founding members of the GYHS, was born at the hot springs and lived there for several years with her family. She is an encyclopedia of information about the landmark. So, consider yourself fortunate if she is your tour guide or gives a presentation about the Gilroy Yamato Hot Springs. 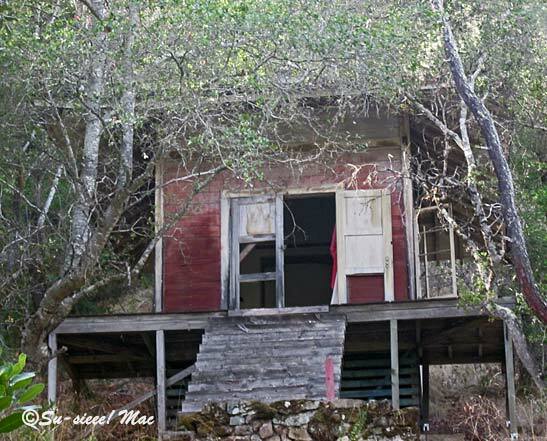 hillside is one of the old-time cottages being renovated. Gilroy Yamato Hot Springs is near the Hunting Hollow entrance to Henry Coe State Park, so you can take a longer hike before or after your visit. The hot springs is only accessible by GYHS guided tours, which are usually available on the 2nd Saturday and 4th Sunday of the month. Visit the GYHS website for more information. Climbing to the mountain peak was a popular challenge of old-time resort visitors. 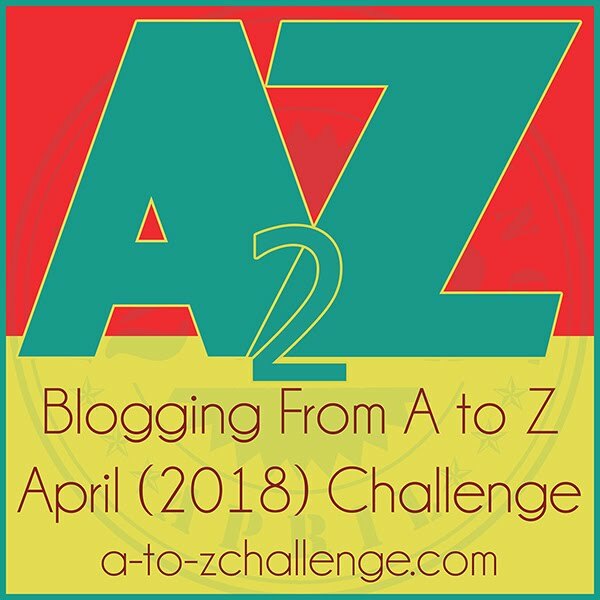 Another late day for me to take part in Alphabe Thursday, hosted by the lovely Jenny Matlock. It's the letter Y. To read other posts or to participate, please click here. Totally sad, Birgit. I'm glad, though, that we are talking about it happening rather than pretending it didn't. I think if GYHS had the funds, they'd consider rebuilding it. I think they'll be renting out the cottages to visitors. Right now, they're seeking a camp host. 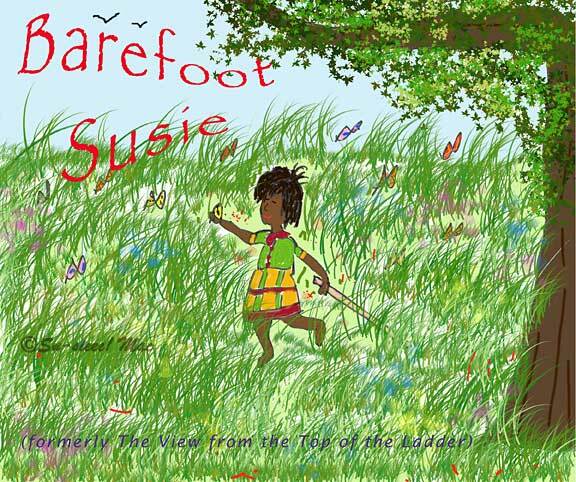 Very nice travel post, Susie. I've been through Gilroy (garlic, anyone?) but didn't stop. I'm wondering if the still give baths in that bathhouse? Been absent from this blog but kept the other going. since early spring for the move. We moved 67 miles, from Montgomery, Texas, to Katy, Texas. Now we are just a few blocks from our daughter and her family. Went to the new Snoopy movie with Mrs. Jim and the six-year-old granddaughter this afternoon after her school. Nice. Thanks, Jim. The bath house is in disrepair, so not in use. They have to install some kind of system before the springs can be used again. That's great that you and Mrs. Jim are near your granddaughter and daughter. There's nothing like being with kids as they grow up. Looks like such a beautiful place and your post is very interesting too. It's sad that it had been neglected ! GYHS is working hard at making it a beauty again. With only volunteers and donations, it'll be slow going though. I love hot springs. Sooooo good for soaking the weary bones. It's sad that this one's no longer open. Two years ago Mrs Widds and I did what amounted to a hot springs crawl around the lower half of BC. Wonderful memories. You never know. It may open one day. I've only soaked in a couple of hot springs. Temperatures too hot or too cold don't appeal to me anymore. That looks like it would have been a splendid place to grow up . . and it looks great for day dreaming now . . . and - thanks for the link - it takes us to fabulous memories . . . I would've liked growing up there. Can you imagine little girls playing in the Shinto Temple? That's what Laura and her older sisters did. I can see it in my mind's eye. What a story. What a great opportunity to see the hot springs! It was! It would be fun to camp there one day. Very interesting. I think I'd enjoy that tour. That kind of thing is right up my alley. That was nice of Harry Sakato to add the word Yamato to the title. He didn't even know about Alphabe-Thursday!